Reserved car parking spaces for the disabled are marked near the front door. Wheelchair access to the building is via the front automatic doors. All consulting rooms are on the ground floor and easily accessible. 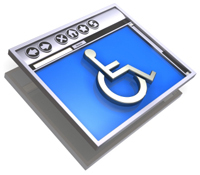 There is a disabled patients WC on the ground floor and a lift is provided to access the first floor. Please ask at reception if you require a wheelchair from your car to the surgery or any further assistance.